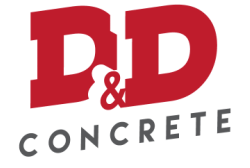 D&D Concrete did an excellent job on our new patio / deck! Unbelievable response and very thorough through the entire process from quote to completion. They were responsive to our requests, even up to the last minute. When they started to pour concrete we had a change request and they pulled the forms and reset as concrete was coming in. They even followed up with us after a few days to make sure we were happy and satisfied with the project. Overall a very enjoyable experience. D&D has a high recommendation from us. Well worth it!!!! - James M.